Do you have thousands of newsletter subscribers? Are your sales reps are pounding the pavement trying to convert leads? Is your advertising budget strong, but your campaigns are falling short? To grow your business, you need to drive people to your website and keep them there. With the right content marketing strategy, you can not only generate leads, but also get those leads to convert and return as loyal customers. A pretty website just isn’t going to cut it; you need to depend on your blog posts and landing pages. let clients and target clients know that you have what they’re looking for. In addition to great content, a blog post should have an even better headline. 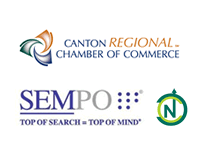 For example, a headline that reads “What One Business in North Canton, Ohio, is Doing to Generate Ridiculous Profits” will attract readers much more effectively than one that reads “Marketing Strategies for Ohio Businesses.” Which one would you click on? Blog posts lead potential clients to you. Once they find you, it’s time to seal the deal. While a blog post offers a glimpse into your company’s personality, a landing page converts readers into customers. The landing page is like the X on the treasure map that says “dig here.” If you want people to find your treasure, you have to make sure they pick up the shovel. A landing page is an ideal culmination for a pay-per-click campaign, but most people are still going to find you via a search, so optimize your landing page’s SEO. Once your audience is viewing the page, you want them to follow through. Make it easy by giving them one clear task. Maybe you want them to download your free e-book that comes with a $29.95/month newsletter subscription, or maybe you just want them to provide you with their email address. Either way, they need to know exactly where to click, and they need to want to click there. Once they’ve found the treasure, they’ll keep reading your blog posts, keep converting on your landing pages, and help you grow your business. → What is Online Marketing?